Explaining The EDL And The Guardian. My reason for writing the post, Imagine you’re a British neofascist, was to convey the political absurdity of the Guardian’s original photograph. 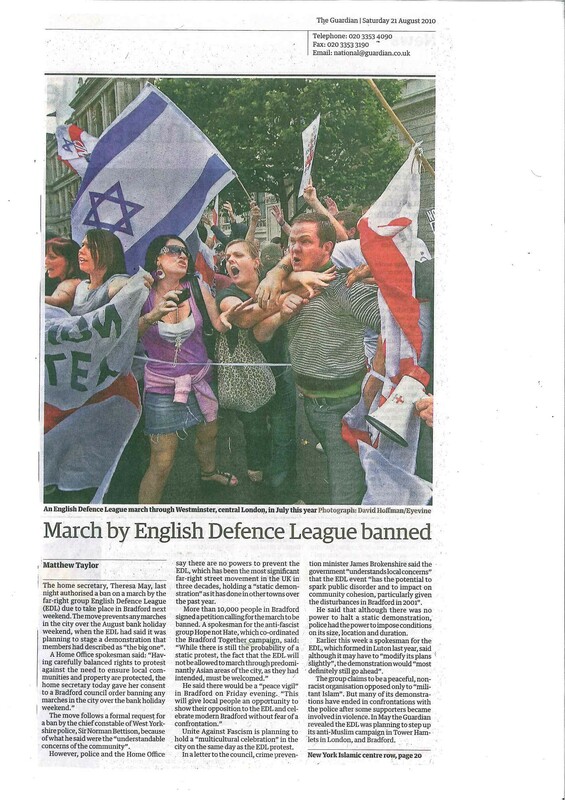 The implied meaning of the photo was to connect the EDL with Israel, and so in turn to Jews. It was to imply, in a not too subtle fashion, that Jews could be EDL thugs too, that was the message coming from the Guardian. This was not the first time that I have run across this (implied) argument and when you consider the politics and history behind it then it doesn’t bear much scrutiny. However, let us step back and be clear that the EDL leadership are made up of neo-Nazis and their allies. We know this from circumstantial evidence, video footage, the publication of EDL events on neo-Nazi bulletin boards and above all from the statements of the one-time founder of the EDL, Paul Ray. Ray admits that neo-Nazis took over the EDL in a video clip, here. But perhaps we should consider some of the underlying issues and see what comes out. In this form of arguing by innuendo, what we are meant to believe is that the neo-Nazis and their close associates, who actually run the EDL and decide policy, have suddenly taken a liking to Israelis, and by inference Jews. Clearly, an alternative line of reasoning is possible, that the neofascists within the EDL are lying about their motives. It is a simpler and much more straightforward answer because otherwise we have to explain away why neo-Nazis would suddenly take a liking to Israelis, and Jews. It seems incongruous, and ever so improbable. Why people would advance these arguments in one way shape or form I can’t say, they are nonsensical because you have to assume a multiplicity of tenuous assumptions, that just don’t hang together naturally. For example, firstly, you have to assume that neo-Nazis are honest about their motives. Secondly, that you can take their word as truthful. Thirdly, that they are sincere in their beliefs. Fourthly, that they have changed completely, to now liking Israelis and Jews. Which is all rather ludicrous and contrary to the evidence. Possibly the reason that this argument, by innuendo, is pushed is that those people advancing it are completely ill-informed about the nature of the EDL? Or conceivably they know next to nothing of politics or history? Perhaps they haven’t thought about the issues? Maybe they are prisoners of their own prejudices, they want to believe the worst and so do. I can’t say one way or the other but what disturbs me is that seemingly highly educated individuals would erroneously jumped to the conclusion that neo-Nazis have suddenly grown a love for all things Israeli, and Jews in particular. Surely, following Occam’s razor, the simpler answer is probably the correct one? And in the case of the EDL that means they are merely putting on a front and lying. Of course, if you’re going to seriously argue the EDL really like Israelis and Jews then it is incumbent on you to provide some concrete evidence other than a flag. Also you would have to explain how neo-Nazis have come to this conclusion and why. Above all, you would have to explain how neo-Nazis have dropped their all-consuming hatred of Jews and are now to be taken seriously. It’s not too surprising that those most keen to advance these arguments are often themselves fierce critics of Israel, but to argue that the neo-Nazis in the EDL leadership should be taken at face value is naive at best. Some gullible types might be taken in, but that doesn’t change the historical evidence nor the fact that the EDL leadership are neo-Nazis and their allies. I favour the simplest answer that the neo-Nazis in the EDL are lying and using this as a ploy to wrong foot their opponents. Seriously, why should we believe the EDL? What compelling reason is there that we should suspend our natural scepticism of political activists? If we would take the words of mainstream politicians with a pinch of salt, then surely the EDL’s and their assorted neo-Nazis’ deserve more than a handful? Ultimately, the EDL are not what they say they are, and anyone semi-serious on these issues shouldn’t be fooled by them, and certainly not Guardian journalists. PS: I am away for a few days, so if you haven’t commented before you’ll get stuck in the moderation queue for the first time, that’s how it works. Oh, and any would-be EDL supporters, please read my comments policy, twice. 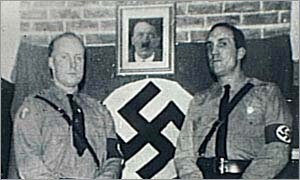 “Further, imagine, that you long for the days when you can openly worship Nazism, as your forbears in and around the leadership of the British National Front used to do. Imagine your frustration, you are a British neofascist and yet you can’t be open about it, you can’t express your admiration for David Irving or visit extreme right-wing Japanese groups without someone finding out. In short you are in a pickle, you want your odious ideology to succeed but realise that most people would sooner eat their own vomit than join you in the Nazi salute. Then you have a bright idea. Why not hide the extremes of your neofascist ideology? Why not wear a suit? Why not try to pick on the weakest in society as your heroes from Nazi Germany did, but do it with a twist? No, that wouldn’t work, so you have to think of another scheme. Who to attack? And who to whip up hatred against? Who to use to build a street army? Then in a flash it occurs to you, you’ll attack immigrants, but stop, that hasn’t been too successful for the BNP. What else can you do? Ahh, attack Muslims, but not directly, not whilst wearing your suit. So you infiltrate a new organisation, you make sure that all your neofascist and neo-Nazi pals are in key positions of power, and eventually take it over. Still you’re worried, as a devious British neofascist, that your political enemies with see through these tactics, and then it hits you, how to throw them off the scent? Pretend that you like Jews. Get one of your knuckle headed friends to get an Israeli flag or two. And when you walk around wave it a lot. What a laugh! Your mates think it is funny, they hate Jews with a passion, but it is a big wind-up and people don’t know how to react, many stop and think, others are fooled and some like your natural opponents in the liberal minded Guardian suddenly think that a bunch of neo-Nazi skinheads have converted to Zionism, how wrong could they be! All the same, as a British neofascist, you don’t mind if the Guardian takes pot-shots at Jews. In fact, you think it is funny, that highly educated journalists don’t really understand modern neo-Nazism, letting you have your way. And once you’ve whipped up enough hatred against the Muslims then you can turn to other ethnic minorities, and eventually Jews. Whilst all this is happening you, as a British neofascist, will have an able ally in the Guardian as they don’t much care for Jews or Israelis either. Plus the fact they haven’t worked out that you can’t stand Jews or liberals, but their gullibility blinds them to the fact that neofascists are frequently dishonest about their motives. The Guardian types don’t know that you will do anything to get power, even tell fibs. But none of that will matter once you’ve grown from a proto-street army to an organised force, all of that will be too late. But, as a British neofascist, you thank your lucky stars that the Guardian editorial staff seem to know next to nothing of history, care even less and have their own set of prejudices. I have a guest post up at CiF Watch, imagine you’re a British neofascist. “Donations are desperately needed to finance the medical costs and rehabilitation of Samar (31) and Juwariya (25) Atique whose young lives and hopes were brutally crushed in October 2009 by two men who threw a jug of acid on their faces as the women were returning home from a day’s work in a rickshaw. Their crime – Juwariya had turned down a marriage proposal from one of the men! They sustained severe burns and injuries to their faces, their eyes and their upper bodies. In acid attack cases, the victims should be hosed down gently with a continuous stream of water immediately to stop the acid continuing to burn into their flesh. But they did not get treatment for five hours after the incident because the woman doctor was threatened with a similar attack by these men and their families. Their eyes were infected and continually pouring out pus. They may be blind for life. They will need to have reconstructive surgery on their noses and lips. Their eyelids were burnt away so they also suffer from itching and dryness in the eyes. Their first operation did not take place till 5 months after the event. To date they have had 3 operations and they will need many, many more. They live in Delhi but they have to travel to a hospital in Chennai, nearly one and a half thousand miles away, where they are getting subsidised treatment. One of the sisters is suicidal, they are both suffering from depression but neither of them has had any counselling sessions as yet. Post-operative care and rehabilitation will take years. They were independent working women, whose incomes contributed to the expenses of a joint family of 11 people. Samar worked for an IT company and Juwariya, ironically ran her own beauty parlour. One other sister and brother have had to give up their jobs in order to look after them leading to a loss of four incomes. The reduced family income is less than the monthly cost of routine medical expenses like bandages, antibiotics and painkillers, let alone the cost of going to Chennai for surgery, let alone the costs of daily life. So far, they have managed with donations and loans from family and friends. Poverty has compounded the consequences of violence. This case came to the attention of Southall Black Sisters earlier this year. Although we do not usually have the capacity to run international campaigns, we felt that the horrific nature of this particular attack served as a salutary reminder of the extreme violence that women round the world continue to face should they make the smallest strike for freedom and assert their most basic rights, in this case, the right to choose their own partner/spouse. I haven’t posted much on technology for ages, so I thought for those of you more interested in politics that I would briefly outline things. Facebook has added “location-based services”, but if you want to turn them off here’s how to do it. A new version of Wine is out, it allows you to run Windows applications under Linux and is first rate. There is more than one way to execute Windows applications on Linux, using Virtual Box is another method and virtual images are exceedingly flexible, if you have the space. Perplexed nontechnical readers may be wondering why they would want to run Linux? Basically it’s an alternative to Microsoft’s operating systems, Windows XP, Vista or Windows 7. Linux does essentially the same, better and often quicker. Linux will run on comparatively slow hardware and make it usable, it is free and comes with access to thousands of applications, also free. Microsoft operating systems tend to need lots of memory and modern hardware to run at acceptable speeds. If there’s a job you do under Microsoft Windows then 98% of the time you can find a good as, if not better, Linux alternative, free. I won’t deny that initially Linux can be a little bit hard to set up, sometimes, but once it is there you’ll find it rocksolid and you won’t need to reboot every couple of hours, as with Microsoft operating systems. Linux is used extensively in business and a sizeable percentage of Internet service providers will host their pages under Linux, my bet is that WordPress runs on Linux so you are reading these pages courtesy of Linux, either directly or via Google, which extensively uses Linux. I favour several versions of Linux, (there are lots!) PClinuxos, MEPIS, Antix Linux and Mint. They’ll do for starters. Basically, you download a big image (called an ISO) burn it to a CD, reboot and install using that, following the defaults, but reading the screens very carefully. Have a spare CD ready. The alternative is to use Unetbootin. Have a blank USB ready, it will overwrite it completely. Download and execute Unetbootin, it will prompt for which version of Linux you’d like, after which it will download the ISO and burn it to the USB stick. Again, once it has been successful, reboot and install if you wish. Personally, I would start using a spare machine if you have one, an old one, just to get use to the installation procedure. These copies of Linux will boot a Live version running from the CD/USB and then give you the option to install on the hard drive if you want. You will need to partition the disk (the hardest part), which makes space for Linux. Then do the install. Easy. Normally takes anywhere from 3 to 10 minutes! Have a play around on that spare machine and you can’t do much damage. Jack of Kent covers two issues that I had been pondering, the death of Dr. Kelly and the charges laid against the founder of Wikileaks. I am not sure what to make of Dr. Kelly’s death, there is quite a lot of conflicting opinion. As for Wikileaks there’s been a number of pieces in the press on how the security services in various countries wanted to clampdown/disassemble/neutralise Wikileaks because of all the embarrassment that they caused, but again I’m not sure. Adam Holland skewers the cranks, bigots and historically illiterates congregating around David Horowitz’s blog. “In 2003, Imam Rauf was invited to speak at a memorial service for Daniel Pearl, the journalist murdered by Islamist terrorists in Pakistan. The service was held at B’nai Jeshurun, a prominent synagogue in Manhattan, and in the audience was Judea Pearl, Daniel Pearl’s father. In his remarks, Rauf identified absolutely with Pearl, and identified himself absolutely with the ethical tradition of Judaism. “I am a Jew,” he said. Ben Cohen covers the disturbing treatment of Cliona Campbell. “Jewish schoolchildren feel intimidated and the school authorities are either indifferent or unable to assist them. To avoid harassment, some children are obliged to change schools and even hide their Jewish identity. A few weeks ago a local Jewish TV station (Joodse Omroep) broadcast scenes of anti-Semitic harassment in the streets recorded by a hidden camera which followed a rabbi accompanied by two students. 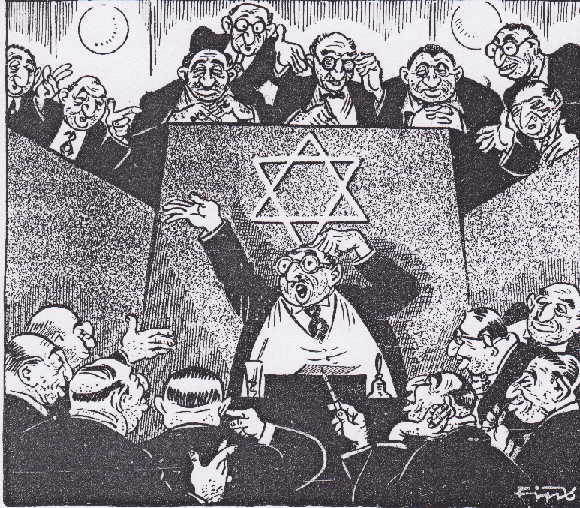 This provided chilling testimony of the intimidation to which Jews are subjected. In response, the Dutch police announced that they might use “decoy” Jews – police dressed in traditional Jewish garb – to entrap anti-Semitic hooligans. Rabbi Jacobs responded by stating that such initiatives would be futile unless accompanied by greater emphasis on education, stressing that not only Muslims were engaged in anti-Semitic agitation.